Bonus Arena Christmas ‘Give the Gift’ campaign to recognise city VIPs. Bonus Arena Christmas video campaign to feature Hull ‘Easter eggs’. With a raft of big budget High Street stores expected to release their long-awaited Christmas adverts, the region’s newest arena has also got in on the act. This Friday Hull’s Bonus Arena will release their own Christmas advert to rival that of John Lewis and the major supermarkets. The animated advert – which is 90 seconds long – follows the heart-warming tale of two friends who visit Hull and end up at the city’s arena. The advert will launch the entertainment venue’s Christmas campaign called Give The Gift which gets underway next week. The campaign will not only promote tickets as Christmas presents, but will also see the arena giving the gift of VIP tickets to people from Hull and East Yorkshire who have done something special this year. 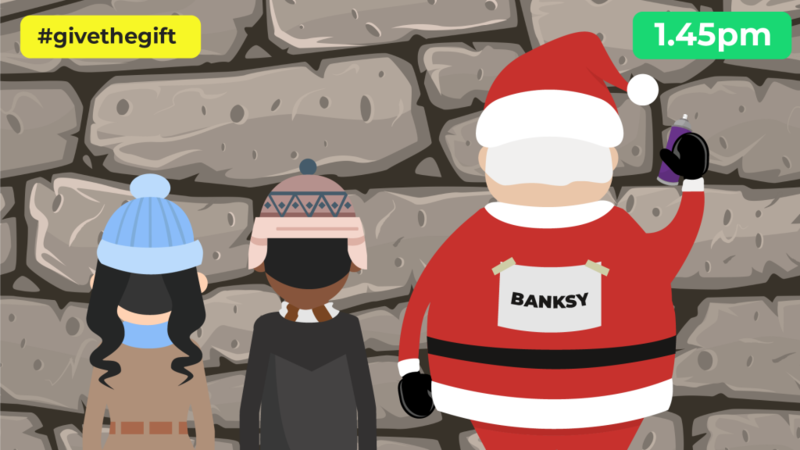 Teaser images – which include Banksy dressed as Santa – have been released today before the video premieres on Friday. The video was created by Hull’s own Squideo, who specialise in animated videos. Paul Savage, Head of Entertainment Sales & Marketing at the Bonus Arena, said: “Releasing a Christmas advert has become a real date in the diary with countless news stories preparing for the release of John Lewis’s festive feature. But it got us thinking – could we do the same for Hull? “Back in September we sat down and thought about how we could use some of Hull’s landmarks to create our own, much lower budget, Christmas advert and we came up with a concept we thought would capture people’s attention. We worked with the team at Squideo to make that idea come to life and we are delighted with the end result. “There are plenty of Easter eggs in the video for the people of Hull to try and find – some will be obvious, but there are lots of other subtle hints to things, and people, in the city. We’ve even included Banksy dressed as Santa! The Bonus Arena’s Give The Gift campaign officially launches next week. The Christmas video will premiere on www.facebook.com/bonusarenahull at 9am on Friday. The Bonus Arena officially opened this summer with a show by the legendary Van Morrison. Other gigs announced so far at the Arena include Boyzone, Courteeners, Richard Ashcroft, The Vamps, Catfish and the Bottlemen, X Factor Live and The Beach Boys. Be the first to comment on "Bonus Arena Christmas ‘Give the Gift’ campaign to recognise city VIPs."